How does an egg deliveryman get to be a major television director and win a dozen Emmy Awards? Kirk Browning, a Ridgefield chicken farmer, a World War II ambulance driver and, just for fun, a pianist, became the award-winning director of “Live from Lincoln Center,” the acclaimed series of television concerts on PBS. He also directed such pioneering works as Frank Sinatra’s first TV show and the world premiere of Gian Carlo Menotti’s “Amahl and the Night Visitors,” the first opera written for television. Kirk Browning was born in Manhattan in 1921. His parents, William and Elizabeth Miner Browning, had a farm on Spring Valley Road for more than 40 years. Kirk attended Cornell University but dropped out after only a month and, still a teenager, got a job as a reporter for a newspaper in Waco, Texas. When he tried to enlist in the Army during World War II, he was rejected. So instead, he served as an ambulance driver in the American Field Service with the Eighth Army. In late 1943 in Italy, he had arrived with his ambulance on the north bank of a river just after midnight, carrying two badly wounded New Zealand soldiers. The river was so swollen by floods that he could go no farther with the ambulance. After the war Browning came back to Ridgefield to work on his family’s Ridgebury farm. Chotzinoff saw something in Browning, a fellow fan of the piano, and offered him a job filing scores in NBC’s music library. 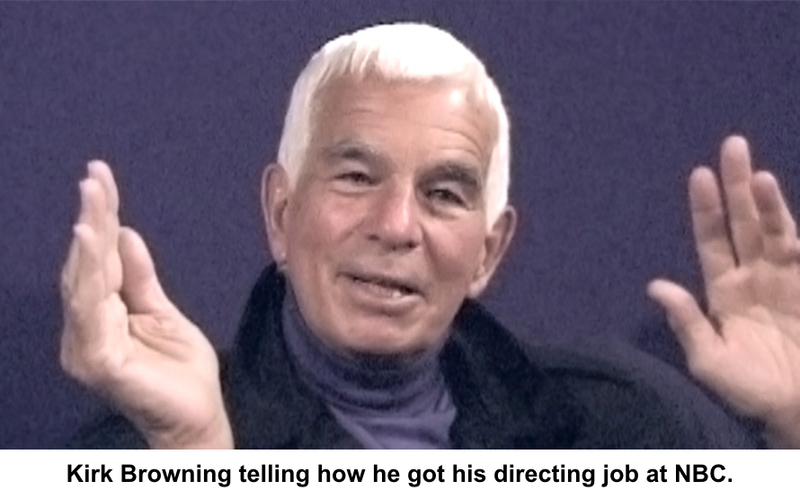 From there Browning began working his way up, becoming a stage manager and then being chosen by Chotzinoff to direct telecasts of the NBC Symphony Orchestra, led by Toscanini. Browning enjoyed telling how he got that job. Toscanini was doing a concert at Carnegie Hall instead of at NBC’s big studio. Since the concert was outside the studio, “they assigned a sports truck and a sports director because it was a ‘remote’ and that’s the team that does it,” Browning said. “The sports director, knowing nothing about music — all he was used to was taking pictures of whatever he saw — he read that there was a piece called ‘The Girl with the Flaxen Hair’ [by Claude Debussy], so he goes out and he hires a lovely blonde girl and backstage puts her on a rock in front of a mirror pool...and as Toscanini is conducting, he ‘supers’ over this girl combing her hair. Chotzinoff and Browning were watching the broadcast together. Chotzinoff was aghast when the blonde appeared. Browning went on to direct 185 broadcasts of “Live from Lincoln Center,” winning 10 Emmys. He also directed telecasts of the NBC Opera Company. Along with his Lincoln Center Emmys and three primetime Emmys for other productions, Browning earned two Christopher awards, a CITA award and a George Foster Peabody award. He never retired, and when he died in 2008 at the age of 86, he was beginning work on another “Live from Lincoln Center,” a New York City Opera production of Puccini's “Madama Butterfly.” It had been a favorite opera of another Ridgefielder from the past, Metropolitan Opera star Geraldine Farrar.